Rockall is a small rock, measuring just 25 x 31 meters and 21 meters high. It is located some 423kn northwest of Tory Island. 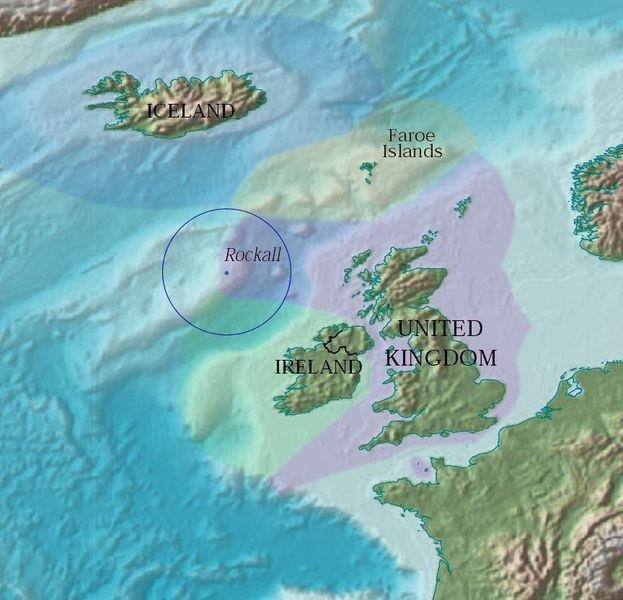 Ownership of the ‘island’ is disputed among Ireland, Great Britain, Iceland, and Denmark. 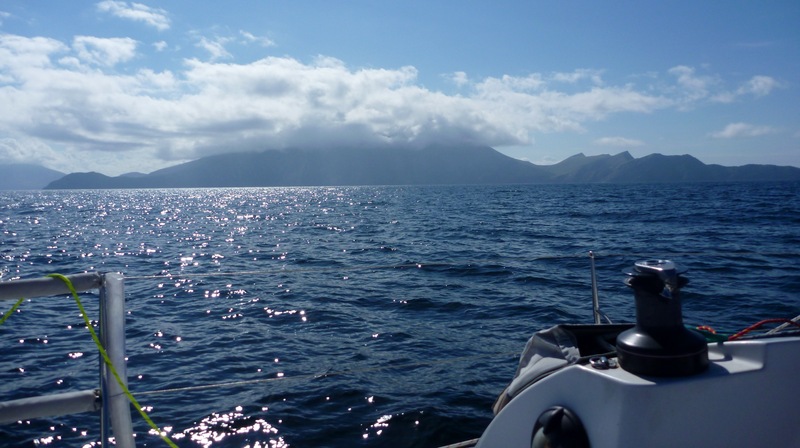 The first of Dinah’s big races this year is the Round Rockall Race, from Galway, around Rockall, and back to Galway again. The race was organised by Larry Hynes and Aodhan Fitzgerald from Galway Bay Sailing Club. 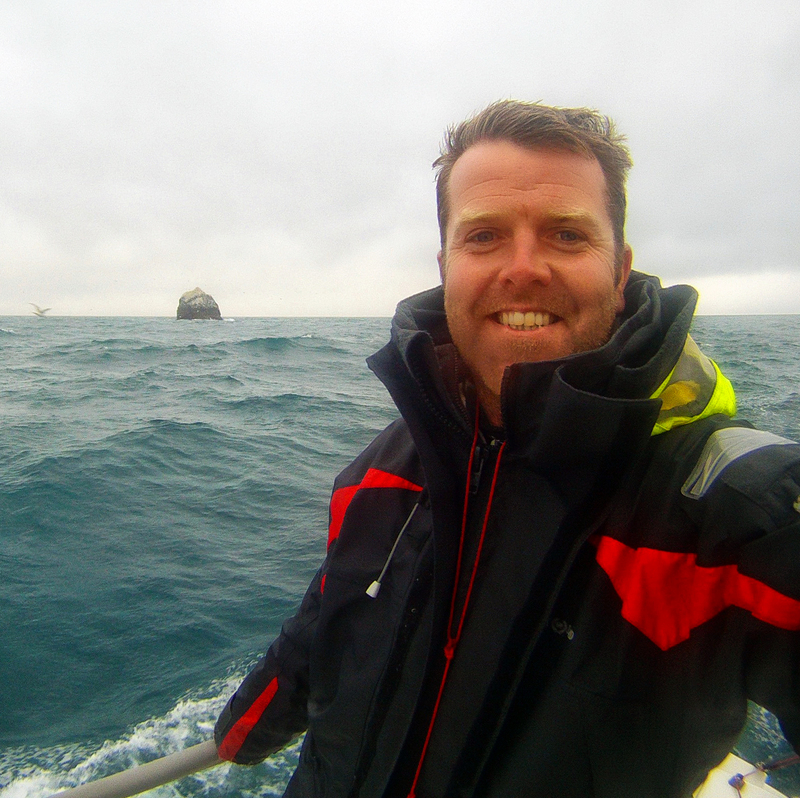 Unusually, the race was to have a solo class, so Barry saw it as a good opportunity to get back out in North Atlantic waters solo for the first time since the OSTAR a few years ago. 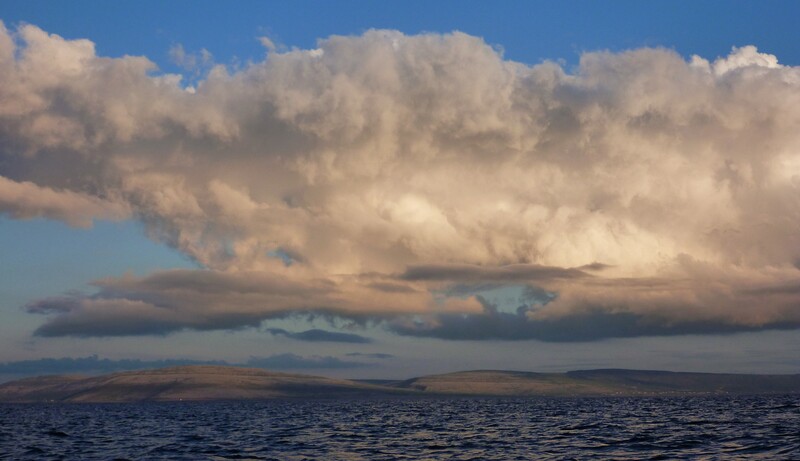 The race started on a really nice Sunday evening with 17knts of breeze from the west creating a true beat in flat water all the way out of Galway Bay, before turning North to head straight for Rockall. 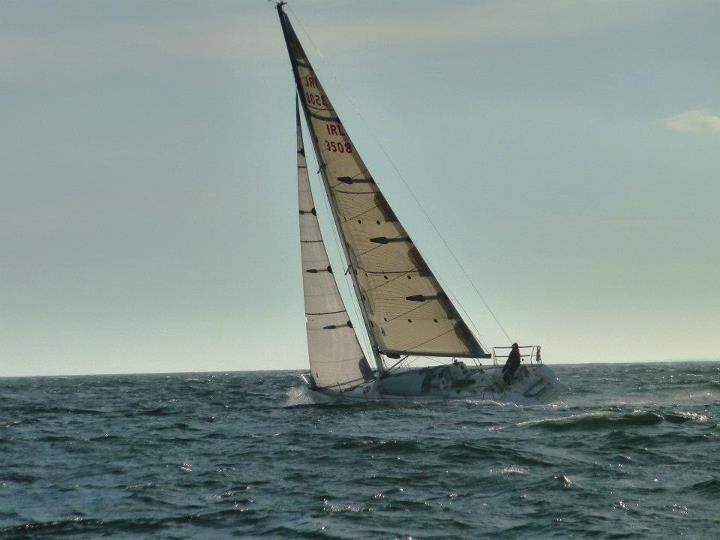 The photo below shows Dinah just after the start, powering upwind. Two and a half days later, Barry successfully rounded Rockall, and at that point in time the predicted corrected times showed Barry two hours ahead of his nearest rival, who was a 54ft carbon fibre racing boat from Germany called Bank Von Bremen (BVB), crewed by nine experienced offshore sailors. On the way back south again the breeze died to nothing for several hours, while BVB was still making good progress towards Galway, being further south on the racecourse. Sure enough, the Malin Head checkin showed Dinah had lost 4hrs, and was now well behind BVB. There was one weather front still to negotiate before the breeze settled down on the approach to the finish. With 28knts of true wind from the southwest, Dinah was just able to lay Slyne Head on Starboard tack, and Barry worked really hard through that last night to claw back BVB’s lead. At the Slyne Head checkin the hard work through the night paid dividends, and Dinah was ahead again as the sun rose on the final morning. At the end of the race, Dinah claimed the victory, beating the fully crewed BVB by 1hr 44min. 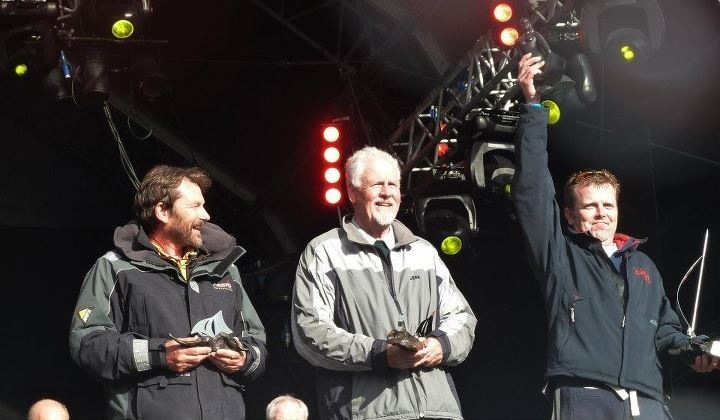 The prize giving was held on the main stage of the Volvo Ocean Race final stopover, which was great for Dinah to get such recognition. Galway was a fantastic place to moor Dinah for a while, and the people there were so friendly and helpful that the whole event was a huge success. Thanks a million to all involved! At the beginning of June we brought Dinah around from Dun Laoghaire to Galway to get her ready for the Round Rockall Race later in the month. Barry and Tom did the delivery double handed over a long weekend. They went northabout to get better weather and to see some of the fantastic scenery along the shoreline. Leaving the east coast early on Saturday morning we took advantage of the end of a storm to make great distance on the first day. By Monday we had run out of breeze and ended up motoring past Tory Island and Bloody Foreland. But for the last 80nm or so a beautiful 14knt sea breeze delivered us to Galway just before the lock gates shut. A quick snooze before heading back to Dublin on the train, and Dinah was safely tucked up on the docks in Galway ready for her next adventure.